The Improv Cooking Challenge is still going strong! We have an entire year of combinations dedicated to share with you! The theme for January is lemon and rosemary. I was a little bit worried as to whether I could find a recipe that meets the strict requirements of the new eating plan that I’m on. 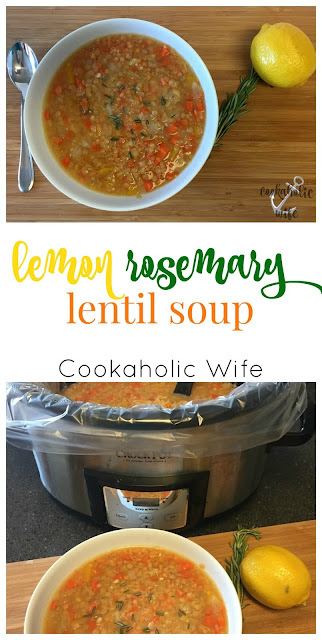 Both lemon and rosemary are allowed at all times, but I wasn’t sure what other ingredients I could pair them with until I found this soup recipe. It was perfect, actually. Last month or so I bought a bag of red lentils on impulse even though I’ve never ate a lentil and I had no idea what to do with them. However, they worked out perfectly in this recipe. Lemon Rosemary Lentil soup is a great vegetarian alternative full of flavor from the lemon and rosemary. 1. Add the onion, yellow pepper, garlic, carrots, lentils, chicken broth, water, salt, pepper and cayenne to a slow cooker. Stir to combine. 2. Cook on low for 6 hours, then stir in lemon zest and juice. 3. Divide into bowls and top with fresh rosemary. Adding the lemon and rosemary at the end really brighten up this soup and bring out the flavors. Lentils are interesting and I think I’ll try cooking with them again. 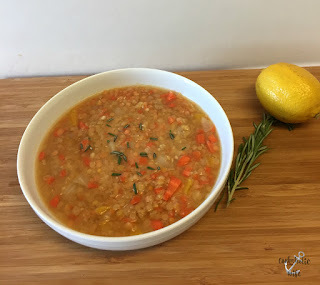 If you are following the Fast Metabolism Diet, this recipe is appropriate for Phase 1 and Phase 3.
mmmmmmmmmmm… My mom used to make lentil soup every winter (but she never added lemon or rosemary) Your bowl looks so tasty, warm & comforting. How funny, I posted in a slow cooker soup challenge yesterday! Looks great! Your soup looks so colourful and delicious! It's nice to know it is also healthy! Good luck on FMD…meals like this make it very easy and enjoyable. 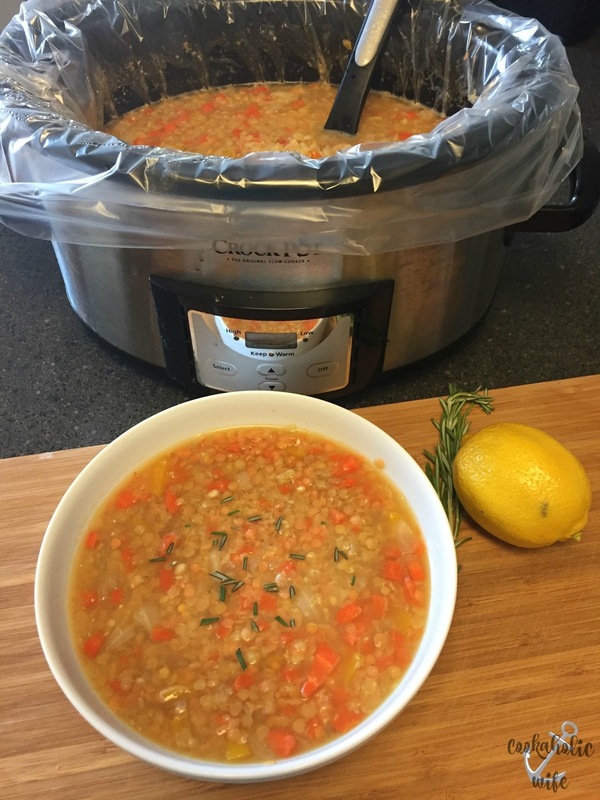 My daughter first introduced me to lentil soup…and I have been a fan ever since. The addition of the lemon and rosemary at the end is a great way to brighten the flavor! I have everything in the pantry and freezer for this soup, well kinda. 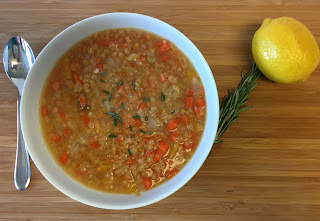 I have yellow lentils and orange and red peppers, and I think it might just work out anyway.